It’s often thought that it’s only in the cooler months that parents of asthmatic children need to be extra vigilant. But this new research has shown that hot weather is just as risky – particularly during a heat wave and especially for the very young. Prof Shilu Tong, from QUT’s School of Public Health and Social Work and the Institute of Health and Biomedical Innovation, said a team of health researchers uncovered the surprise finding in a study of hospital admissions during extreme weather events. “This study was conducted because little information is available on the quantitative relationship between extreme weather events and asthma,” Dr Tong said. “It is vitally important to examine the vulnerability of asthmatic children to climate variability and change. Asthma is one of the most frequent chronic childhood illnesses worldwide, and is one of the most common of the five most frequently reported long-term conditions in Australia for children younger than 15. There’s no cure. It is useful to know when attacks are likely to occur, so that health authorities can plan better interventions and treatments. And this is important stuff for parents to know. Male children aged up to four were the most vulnerable during heat waves. Children aged 10 to 14 years were more vulnerable during cold events. 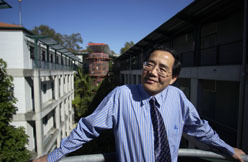 Dr Tong said other research had shown temperature fluctuations exacerbated asthma attacks because they impacted on inflammation pathways or airway hyper-responsiveness, and often occurred at times when other triggers were in play, such as viruses, bacterial activity, the growth of indoor allergens and a change to time spent outdoors. He said research suggested that cold-weather asthma hospital admissions could be made worse because children spent more time indoors at a time when bacteria could survive longer in water droplets. This created a perfect environment for person-to-person infection. The cold air then caused a narrowing of airways, increasing the asthma effect. However, he said there was little research around why children experienced high asthma rates during high temperature events. He said some research suggested hot weather helped allergens grow indoors, such as cockroaches or mould, and that changing pollution patterns in warm weather combined to triggered asthma. He said the findings were particularly concerning when the effects of climate change were considered. The research took into consideration levels of air pollution, relative humidity, the day of the week, the season and long-term weather trends to isolate temperature as a risk factor of asthma. It was conducted by researchers from QUT, Griffith University, University of Queensland and the Anhui Medical University in China. Find a copy of the report here. Amanda Horswill | Communications Officer (Mon to Thurs) | QUT Marketing & Communication | 07 3138 1150 | a.horswill@qut.edu.au. Professor Shilu Tong’s research has found a spike in childhood asthma attacks during heatwaves.